Date : Issued in AD 42 by Claudius. Size : 27.4 x 29.4 mm. Weight : 10.61 grams. Grade : VF but the surfaces are rough. Obverse : Head of Germanicus right, with GERMANICVS CAESAR TI AVG F DIVI AVG N around. 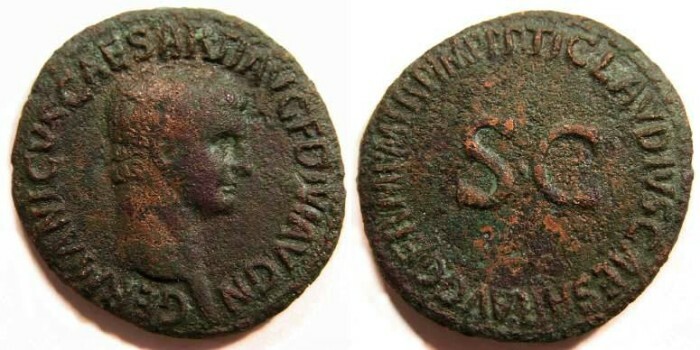 Reverse : S C with TI CLAVDIVS CAESAR AVG GERM P M TR P IMP P P around. Germanicus was the brother of Claudius and father of Caligula. He died in AD 19 and all coins in his name were issued long after his death, by either Caligula or as in this case, Claudius.